Most people around my age would have heard of Living Colour. Their monster 90’s hit and FM radio staple, ‘Love Rears it’s Ugly Head’ saw to that, but I think people mistakenly write them off as one hit wonders even if they still heard the anthem that was ‘Cult of Personality’ from a few years before. Far from the truth of course because despite their respect and influence within the industry since the late 80’s claiming different, 2009 sees them finally release their fifth album in 21 odd years, The Chair in the Doorway, and it’s pretty solid. I didn’t really catch their under-the-radar released 2002 effort, Collidoscope (a record and reunion apparently born out of reaction to the 9-11 attacks), but it is known to be an auspicious release given the long time between recordings. Having disbanded after 1993’s hard-rocking opus, Stain, a few live guest appearances started to happen in the early 2000’s, then Collidoscope came after which another (recording) hiatus ensued. Luckily for us, they have regrouped yet again, with what feels like more energy than in the past, and picked up where they left off in ‘93. With a not overly clean production, hard-hitting Helmet-esq riffs puncture the heavier numbers of Chair. Songs such as ‘Decadance’ and ‘Out of My Mind’ could be virtual Stain B-sides with their black denim attitude. Not to say they haven’t evolved beyond or in that particular sound, more that they still thankfully retain it with a passion. They have always encompassed so many styles however, it was never easy to define what their sound was. The colourful early days of Vivid and Time’s Up saw them incorporate everything from soul, rock, blues, pop, reggae, punk and metal as well. Chair still embraces them all and what is achieved is a schizophrenic combination of the harder-edged Stain and the inspired creativity of songs such as ‘Cult of Personality‘or 'Bi'. Guitarist Vernon Reid - once touted as the next Hendrix (though more like a black Tom Morello), impresses whether espousing metal-tinged chorus riffs or providing grand sweeps in tracks such as the instant single, ‘Behind the Sun‘ & the unforgiving ‘Hard Times‘. Reid’s manic solos still remain a highlight as they did over a decade ago too. Behind it all, the simplistic but absurd brilliance of Will Calhoun’s drumming is more than complemented by the precise bass work of Doug Wimbish. Vocalist Corey Glover’s distinct tone punctuates and soars over the three piece’s impressive musicianship, giving us a collection of songs that are just a pleasure to listen too. The lyrics on Chair explore themes of identity crisis and purpose - a possible reflection on the band’s present and unpredictable future states of mind. 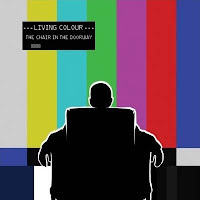 Overall and defying the odds, Living Colour have once again produced something that goes beyond trend or what is designated as ’mainstream’. If only they had kept it up after 1993, they would deservedly be more well known as one of the most important American rock bands - black or otherwise - in the last 20 years. Better late than never, The Chair in the Doorway sees the band pick up where they left off with definite confidence. For some it may seem lacking and only occasionally great, but for fans, it’s in impressive return to form even if it doesn’t quite match their formidable previous albums.